I was turned on to Mark Driscoll in the last six months and have an an awesome time reading his books and listening to his teachings. I determined about the same time that Vintage Jesus came out, that rather than jumping into that book, I wanted to “catch up” and read his other works. That began with my reading of Radical Reformission, and has now extended into my reading of Confessions of a Reformission Rev. In this book, Driscoll chronicles his journey and that of Mars Hill Church as they’ve grown from a ruddy bunch of “Christian college kids and chain-smoking indie rockers” meeting in the youth room of a fundamentalist church into a growing, thriving and incredible story of hope in the city of Seattle. I’m not sure if it is due to his incredible use of metaphor – describing a prosperity gospel church as, “for them, Jesus was a pinata, Christianity was a whacking stick, and their mission was to teach people how to get goodies to fall out of heaven.” – or if his amazingly raw subtitles of his chapters (Ch. 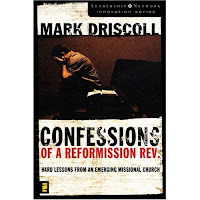 3, Jesus, Satan Showed Up and I Can’t Find my Cup – 75-150 People) are what I connected to the most, but ultimately it’s a fantastic story that I am deeply indebted to Mark Driscoll for sharing.